Making rice the perfect, grainy way.. with the long grain separated.. yes this is the problem I have seen with a lot many people who fail to achieve the perfect results for the same, and end up either overcooking or under cooking the rice, which turns out to be either too soggy to eat, mostly in presentation, or it is a little bit uncooked, which becomes difficult to eat. A lot of people asked me how I always achieve the perfectly cooked rice, so today I'm sharing my method. 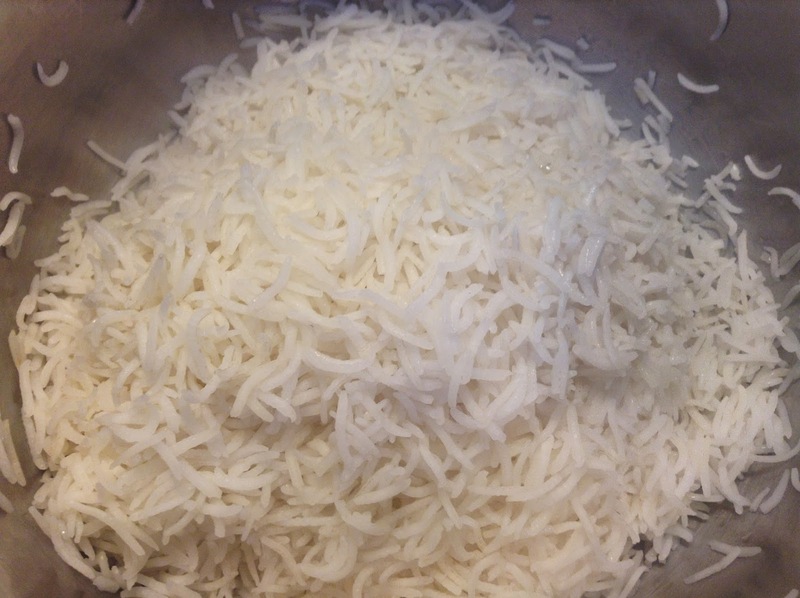 I am using long-grained basmati rice for this results. The results will depend on the brand and type of rice you are using. 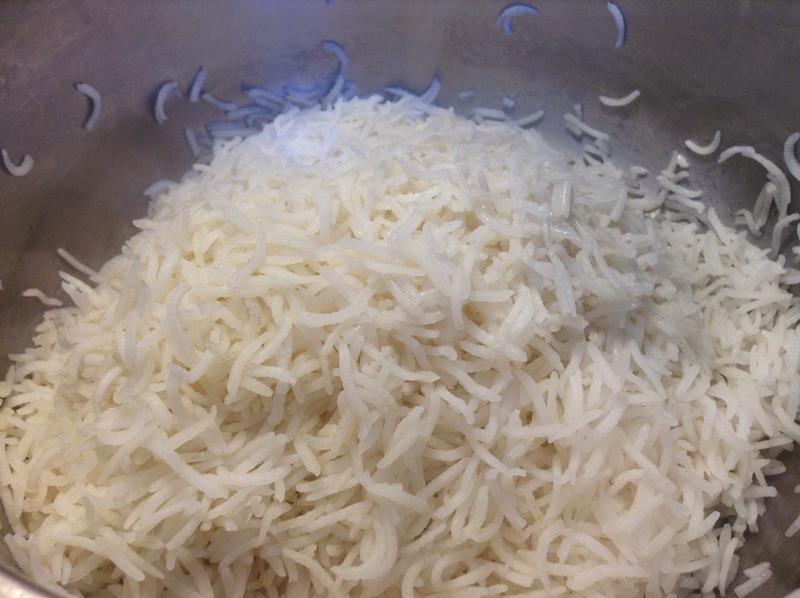 Wash the rice thoroughly and soak in water for about 10 minutes before preparing. Drain water and add 4 times the water of the quantity of rice taken, that is, 4 cups of water for a cup of uncooked rice (I do this to remove starch from the rice, you could take twice the water if you don't wish to remove the starch; in that case 1 cup rice + 2 cups water). Put the container on the highest heat uncovered and bring it to a rolling boil (when the water boils completely and you see the white starch being formed on the top). Turn off the flame (I use an induction cooking range which stays hot for quite a lot of time, but if using flame stove top, turn the heat to the lowest). Remove the boiling rice container from the heat and carefully drain the foamy white water on the top, this is the starch. Handle this water carefully because it has boiling water in a super hot container. Don't let any rice fall through, use a sieve if required. If you are not wanting to remove the starch, simply turn off the heat (for induction cooking range) or turn the heat to lowest (for flame stove tops) and let cook uncovered till all the water is absorbed. After removing the starch, most of the water will also be drained through. Now keep the container back on the heat (turned off/ minimum flame cooking range) and cover. Let cook for 3-4 minutes. Remove from cooking range. Serve hot as Jeera Rice, make Indian fried Rice or just any other rice variety, or serve as it is with any chicken curry/vegetable curry. Loved this post? Do share it and leave a comment/feedback in the comments section below. Don't forget to connect with me on Facebook for regular yummy recipes and kitchen tips. I'm using India Gate brand basmati rice. thanks a lot.